Acholi Sub-region in Northern Uganda has been severely affected by armed conflicts between the government army and the Lord’s Resistance Army (LRA) from 1986 to 2006, lagging behind the rest of the country in terms of development. Ninety percent of the local residents became Internally Displaced Persons (IDPs) during the fighting, and experienced a difficult life in IDP camps. After a cease-fire agreement in August 2006, the security conditions have improved and many IDPs returned and resettled in their respective home communities. However, the poverty rate of the Northern Region remains high, and means of livelihood need to be secured for the returned IDPs. 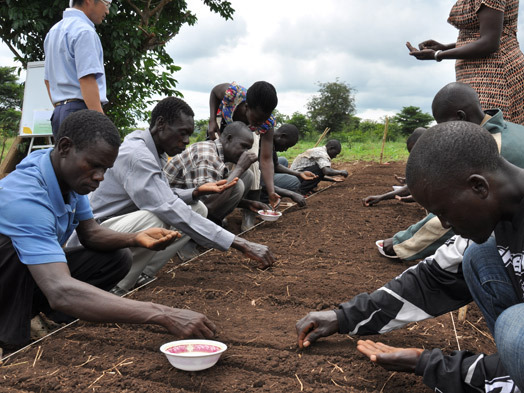 In Northern Uganda, about ninety percent of the labor force is engaged in agriculture. However, they do not have enough experience and technical knowledge on agriculture due to the long-term conflict, and consequently they lack financial resources to invest in agriculture. Many farmers remain subsistence farmers. Therefore, assistance to improve their livelihood is important from the viewpoint of poverty reduction and minimizing disparities between the North and the others. The Government of Uganda made a request to the Government of Japan to provide technical assistance for the improvement of livelihoods of small-scale farmers in the Acholi Sub-region through adopting market oriented agriculture. This Project provides assistance through promotion of market-oriented vegetable production and sales and improvement of quality of life at household level. market survey, to identify vegetable varieties, respective seasons of a high demand, prices, means of buying from farmers, etc. Many farmers in the Acholi Sub-region have limited experiences in agriculture, having little experience to grow commercial crops in particular. Thus, the Project aims to provide farmers mainly with the knowledge of basic technology suitable for low-input vegetable farming. 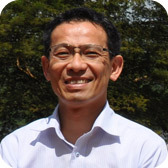 While extending the vegetable farming technology, varieties of methodologies and concepts for supporting farmers are examined and integrated into an approach of market-oriented agriculture through changing their mindset from “Grow and Sell” to “Grow to Sell” for farmers to practice the approach. A major characteristic of the Project is the livelihood improvement approach that is made up of two integrated components: to increase income through market-oriented farming, and to improve the quality of life. The livelihood improvement approach targets not only to increase income through vegetable farming, but also to benefit the entire household, by incorporating practical trainings such as household economy, effective use of generated income, and nutrition and hygiene. 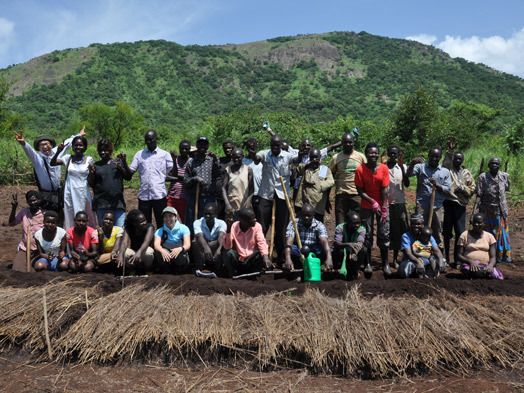 This five-year Project sets its goal to improve livelihoods of target farmer groups through establishment of the livelihood improvement approach, and its overall goal is that the livelihood improvement approach is adopted in Acholi Sub-region. 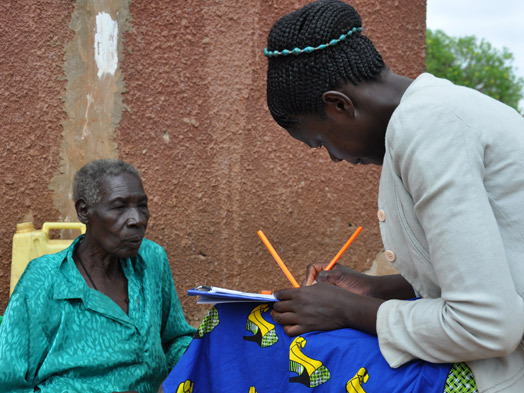 In Uganda, it is extension service providers that play a role in providing technical advices directly to farmers. Therefore, the Project recognizes extension service providers as a training implementation body, who conduct trainings for farmer groups. The first step of the training on livelihood improvement approach is that the participants set up “family goal”. In order to sensitize the participants to the concept of “Grow for the Entire Farmer Household”, the Project recommends that not a single member but more than two core members of the family (such as both husband and wife, and mother and her eldest son/daughter) attend the training and discuss together how to use the income from vegetable production and selling for all family members. Following this, a series of activities are conducted. 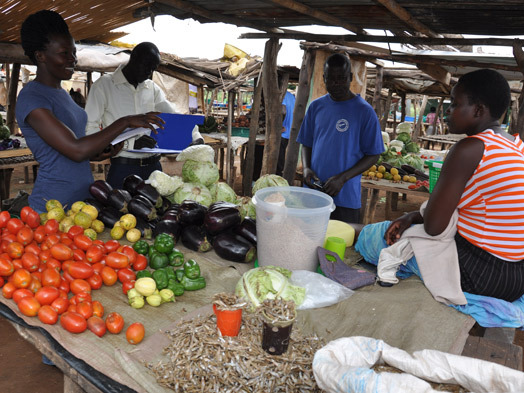 Training focusing on “to Sell” includes sessions of market survey and business forum, in which farmers themselves survey vegetable varieties of a high demand, quality, seasons, etc. in markets, and they further interview market vendors and traders. The objective of these sessions is that farmers acquire a mindset “to Sell”, such as what vegetable items and varieties of these items are popular and how to sell them at a good price. Based on the information they collect from the survey and interviews, farmer group themselves select vegetable items to grow. Training focusing on “Grow” follows. On the vegetable items of their choice, sessions are conducted on vegetable cultivation technologies (such as sowing seeds, raising seedlings, and pests and diseases management) and farm planning for vegetable production and cost and profit calculation. There are a long rainy season and a short rainy season in Uganda, with which cultivation is possible two times a year. Training in the first rainy season targets respective groups as a unit, training them on vegetable cultivation technologies at their group demonstration farm. Another training in the following rainy season targets small groups consisting of five members or so, who individually put into practice the knowledge and skills they learn through trainings. The Project aims to have farmers acquire technologies and knowledge effectively, using such small group learning system. Training contents are well-elaborated to fit the real situation of farmers and to impact on their actual livelihood. For farmers based on subsistence farming, agricultural products are essential materials for their daily meals that support health of the entire family, as well as crucial source of income that can be changed into cash to meet the basic human needs such as medical expenses and education fees. However, farmers face shortage of agricultural products and cash every year. The Project therefore advises farmers to carefully evaluate yearly necessary volume of agricultural products, and provide them with trainings on; how to develop a plan for vegetable/crop production taking into account risks of poor harvest and nutrition for family (Training Sessions on Farm Planning for Vegetable/Crop Production), how to manage stocks of agricultural products, income and its effective use (Training Session on Household Economy for Family Members), and how to improve food preparation and hygiene for family health (Training Session on Food and Nutrition for Family). There are many illiterate people due to the long-standing armed conflict in the Project area. The Project prepares training materials using many illustrations with fewer letters and conduct trainings in a workshop style so that the participants are expected to understand the concept easily, even if the contents are complex or highly technical. The Project hopes that the participants learn many things in a realistic manner and utilize them to impact on their actual livelihood. Moreover, the Project pays full attention to the “Consideration to Social Impacts”. In the Project area, there are many widows losing their husbands during the fighting, orphans, and disabled people such as former soldiers and residents injured in the battle and stepping on landmines. The Project imposes the condition in target farmer group selection that candidate farmers groups must include such socially vulnerable people in its members. The Project also adopts a gender consideration system by setting selection criteria that more than thirty percent of the group members are females. The Project is in its third year. The Project has already started seeing gradual changes, such that the trained extension service providers understand the training contents on vegetable production and livelihood improvement and advise farmers with confidence, and that some farmers in the target groups sell their vegetables to markets to earn cash and improve their quality of life. Acholi Sub-region is the target area of the Project, where most of the local people suffered the armed conflicts for more than 20 years. Results of the situation analysis revealed that there were people kidnapped by the rebels, and some family members were killed in the worst case. Many people are still facing social prejudice conceived during the conflicts even after returning their home communities. The war ended, but the impact of it still remains deep inside the area. There are many socially vulnerable people such as widows, child mothers, and formerly abducted persons in the area, and the Project must do its best to enable farmers including socially vulnerable people to realize livelihood improvement with careful consideration to such social circumstances, and I think that is why we are here. Various measures and a lot of considerations are required to do it, and the whole project team will work as one to accomplish the goal.